Egyptian President Abdel-Fattah El-Sisi wished all Egyptian Copts a Merry Christmas through his official Twitter account on Monday. “Merry Christmas. Filled with peace, love, and compassion in the heart of every Egyptian and every vigilant conscience and every striving soul which sacrifices for love, goodness, brotherhood, and humanity. 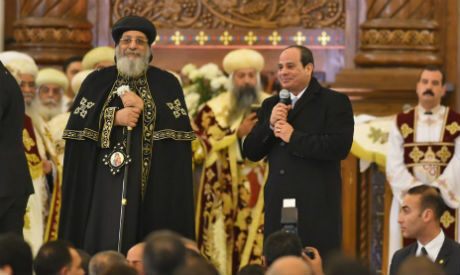 Many happy returns to the Christian brothers,” El-Sisi posted in a tweet. Coptic Orthodox Christians, who make up a substantial majority of all Christians in the country, celebrate Christmas on 7 January, following the Julian calendar. Monday is a public holiday in Egypt. The tweet comes a day after he inaugurated the new Nativity of Christ Cathedral in a lavish celebration. The biggest cathedral in the Middle East is located in the country’s new administrative capital. The Egyptian president also inaugurated Al-Fattah Al-Alim Mosque in the same capital; it is Egypt’s largest mosque and one of the biggest in the region.